The story is told by two narrators, Quinn, the white kid, and Rashad, the black kid. You get to know each of these characters personally as the narrator alternates between chapters. Quinn is an older brother to Willy, and son to a single-mother. His father passed away years before. Rashad is brother to Spoony and son to a mother and father, a father who is a police officer in the community. The problem begins when Rashad is thought to be stealing from a convenience store and is taken outside and assaulted by Officer Galuzzo. Turns out that Quinn is within viewing distance, and he sees the whole thing happen outside. Rashad goes to the hospital where he finds he has a broken rib and a broken nose, among other scratches and bruises. Over the course of the week when Rashad is in the hospital, the news breaks, kids (and a few teachers) at school are left in turmoil, and a protest is organized as a response. I think these authors did a really great job of representing both sides of the story well. This book isn't one that puts the work of our law enforcement officers down, in fact, does quite the opposite, and with a twist about a two-thirds of the way through, you can see that these authors were purposeful in creating a story that values the tough work our officers do each day, and also shedding light on what it's like to be an African American teenager growing up in the States. There are so many great conversations in the text, things that Rashad's mother shares with him that, unless you are an African American family in the United States, you might not realize have to happen. There is also a lot of internal dialog on Quinn's behalf, and some arguments between him and his white friends that illuminate the complexity of this issue. The theme of racism is presented well, and the reader is left understanding that yes, it does in fact still exist today. This book is a Corretta Scott King Award Honor book and has received a new honor - The Walter - from Walter Dean Myers. I highly recommend it. Deep into themes related to our current events and how they unfold for our young adults, next for me is American Street by Ibi Zoboi. I'll be back with another review when I get finished with that one. 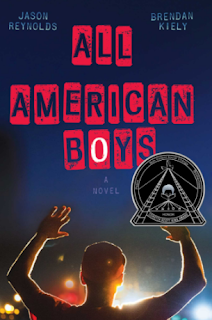 Have you read All American Boys or anything else by Jason Reynolds? Please share! I like how you explain a lot about your back.